SARANAC LAKE, N.Y. (CNS) — Daniel Courtney could feel the tightening grip that drugs and alcohol had on him in the years after he served in the war in Iraq. The former altar server from Rockaway Beach, New York, and Navy war veteran was increasingly using alcohol and cocaine as a way of coping with his war experience and life’s other traumas. Courtney had short-term stays in military and U.S. Department of Veterans Affairs hospitals in the past to be treated for substance abuse and post-traumatic stress disorder and he enjoyed brief periods of sobriety. 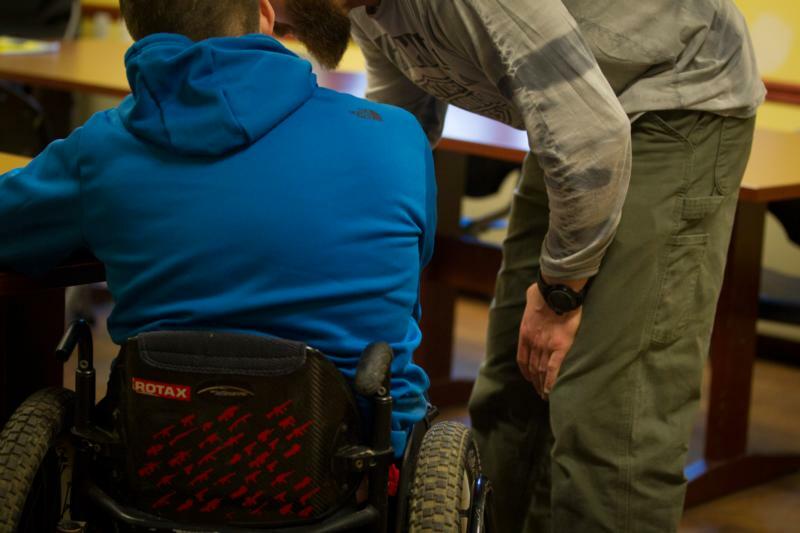 However, by 2014, a happy, sober, stable civilian life seemed far out of reach to Courtney, who had been offered a 90-day stay at another VA rehabilitation center, which didn’t seem like enough treatment time to him. So, VA counselors told him about a recently opened inpatient substance-abuse rehabilitation facility in Saranac Lake specifically designed to care for military veterans, where patients participated in a six- to 12-month-long treatment program. The information about the Col. C. David Merkel, MD Veterans Residence at the St. Joseph’s Addiction Treatment & Recovery Centers in northern New York’s Adirondacks got Courtney’s attention. “I said that is probably better for me,” he recalled telling the VA counselor. The then-34-year-old Courtney traveled to St. Joseph’s and he was mesmerized by the beauty of the area. As he settled in, the spiritual nature of the place reminded him of his Catholic upbringing. With the help of a $3 million grant from New York state, St. Joseph’s built a 10,000-square-foot, 25-bed facility in 2014 to house its new veterans program, tailored to focus on the specific vulnerabilities and emotional triggers for members of the military, said Bob Ross, CEO of the 45-year-old treatment center. St. Joseph’s was established in 1971 by the Franciscan Friars of the Atonement to treat alcoholics who lacked the financial resources for treatment. The friars steadily expanded the center to include chemical dependency and family co-dependency care. Though the facility is no longer operated by the friars, its Catholic roots are deep and the independently run treatment center has carried on the tradition of providing more than $300,000 in charity care annually, said Deacon Steven DeMartino, chairman of the board of directors for St. Joseph’s. Veterans who are treated in St Joseph’s new program are asked for a donation for their care if they have the financial resources to do so, but if they don’t, the cost of their treatment is covered by ongoing support from the state, Ross said. The new center made it possible for Theodore Fendick of Johnson City, New York, to really delve into the source of his alcoholism in the nine months he stayed there. The Air Force veteran had been to rehab seven times before he went to St. Joseph’s, but said he now feels better equipped to manage his disease. Fendick also decided to stay in Saranac Lake to live and work in the serene setting and take advantage of the close proximity to the treatment center. It’s not uncommon for patients who complete their program to remain in the area, said Zackary Randolph, the veterans program director at St. Joseph’s. As part of their treatment, the veterans are encouraged to volunteer as cleanup crew members throughout the town, work in the local food pantries and help out on the grounds of St. Joseph’s, Randolph said. The work is therapeutic and provides the men with a sense of engagement with the community, he told CNS. Randolph is not the only recovering substance abuser on staff. Nor is he the only veteran. A majority of the veterans program staff members have either served in the military or have had a close association with the armed forces, giving them a deeper understanding of military culture and the struggles that are unique to those who have served, he said. The staff’s understanding of military life was not lost on Fendick, who said they provided him with a therapeutic home that made him feel like he was welcomed and accepted.